This economical pocket gauge is imported from China and represents excellent quality. It has a hardened steel spindle and a corrosion resistant, lightweight frame. A hard shell storage box is included. The 351 has inch increments, a range of 0.5", and graduations in .001". The 351M has metric increments, a range of 12mm and graduations in .01mm. The price of the 351 is $119.95, the 351M is $124.95. 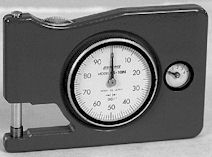 This dial thickness gauge has the same features as our other paper gauges, but it features an elongated body and is especially good for bench use. Imported from Japan. The 4600 has inch increments, a range of 0.5", and graduations in .001". The 4450G-M has metric increments, a range of 10mm and graduations in .01mm. The price of the 4600 is $119.95, the 4450G-M is also $119.95. This handy, economical paper gauge can be purchased in either inch or metric versions. It also comes in four modern colors: blue, silver, yellow, and green. Please specify the color when ordering. This gauge has very smooth gearing and comes with a soft carrying case. The CS-10 has inch increments, a range of 0.417", and graduations in .001". The CS-10M has metric increments, a range of 10mm and graduations in .01mm. The price of the CS-10 is $109.95, the CS-10M is also $109.95.